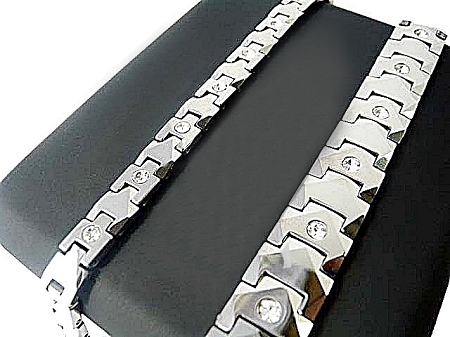 2 PIECES/SILVER DESIGN WITH CZ DIAMONDS Size Men: Length 21.5cm (8.5"), Width 1cm (0.4") Size Women: Length 20.5cm (7.5"), Width 0.8cm (0.2") Benefits of FIR (Far infrared Ray) Stone, Germanium Stone, Magnetic Stone and Negative Ions Stone which comes embedded in this Bracelet Benefits of Germanium and FIR Stone - experiencing stiffness or pain in the back, shoulders or neck. - Sleeping disorder, stress and Anxiety attacks etc. - having numbness and muscular ache of arms or fingers. - having poor blood circulation. - working long hours with electromagnetic devices such as computers, mobile phones. Prolonged wearing of Germanium Jewelry may assist in: - help in body and mind relaxation. - promote a sense of well-being. - increase alertness. - energises a person. - neutralization of free radical. - removing toxins and other wastes in body. - Improve blood circulation. - Increase sports performance and stamina. - Discharge of Toxics and other wastes in body. - Increase Alertness. 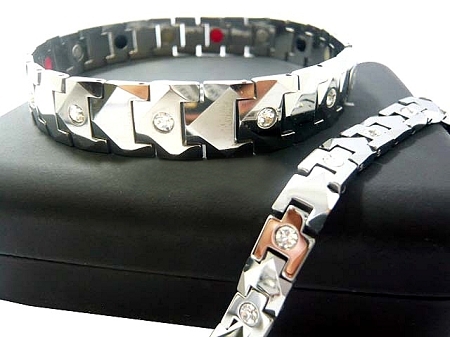 Germanium based bracelets or necklaces are commonly used as a Therapy and it is inexpensive, non-intrusive and nontoxic way of medical treatment used worldwide. Advantages of Magnetic Stone Using Plethysmography, a method for measuring blood flow in the fingers, experts have shown increased blood flow by as much as 300% when the finger is subjected to a magnetic field for five minutes or more. This increased capillary circulation speeds up the fluid exchange: bringing more fresh, oxygenated blood to the area, flushing away lactic acid and other pain causing chemistry at a faster rate These statements have not been evaluated by the Food and Drug Administration. This product is not intended to diagnose, treat, cure or prevent any disease. Individual results may vary.